This ready to use fungicide provides protection against major lawn & plant disease. 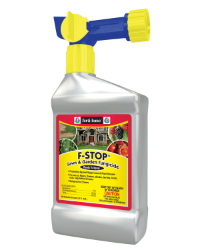 For use on roses, flowers, shrubs, berries, fruits, nuts, vegetables, and lawns. Rainproof in 2 hours. Treat once every 2 weeks on ornamental shrubs and flowers throughout the growing season until diseases are no longer present. Cover both upper and lower leaf on plant surfaces. One quart of product will treat 1500 sq. ft. of lawn area.